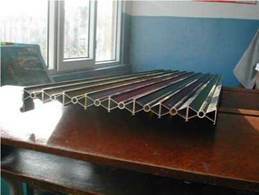 In this study the experimental results of a solar energy collector which is installed to a south classroom window of a school in Istanbul are presented. The collector unit had been tested experimentally and numerical to determine its thermal performance before its integration into the south window. In this paper, the experimental analyze will be given in detail. The collector is tested using infrared radiation lamps in the laboratory. The collector reaction to change in the value of heat transfer is measured. Air temperatures and velocities are measured at the bottom (air entry) and top (air exit) of the collector. Moreover, performance of the collector geometry is analyzed using Computing Fluid Dynamics (CFD). The results of the measurements and theoretical analysis are compared. The back face of the collector is insulated to generate effective convective air flow on the basis of the test results. Then thermal efficiency measurements were executed in the classroom and the efficiency curves displayed and evaluated. A computer system with a software was designed to obtain air temperatures, velocities and solar radiation data in the classroom. Keywords: Solar heating, solar collector, experimental, collector geometry. Figure 1:The detail of solar collector. Figure 2. 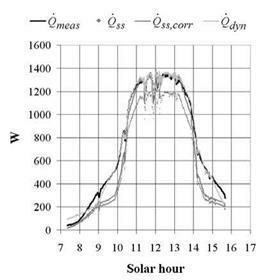 The profiles of solar collector. A novel integral compound parabolic concentrator evacuated solar collector (ICPC) array has been in continuous operation at a demonstration project in Sacramento California since 1998. An ongoing study addresses the impact of optical, thermal, degradation and component failure factors on array performance over the ten years of operation. This paper reports on the ray trace modeling for the vertical and horizontally oriented fined absorber tubes and the degradation of the reflector in the tubes of the array. The paper will include a review of collection system performance and reliability over the ten years of operation, the design of the simulation, animations of rays striking at various angles, the incidence angle evaluation and the design of the laser device. Research on CPC solar collectors has been going on for almost thirty years. See Garrison  and Snail et al . In the early 1990s a new ICPC evacuated collector design was developed. The new ICPC design allows a relatively simple manufacturing approach and solves many of the operational problems of previous ICPC designs. The design and the fabrication approaches are described in Winston et al  and Duff et al . Based on the project results Fraunhofer ISE together with the partners DLR and PSE performed a technology comparison between Linear Fresnel-Collector (LFC) and Parabolic Trough (PT) for a 50 MW solar power station. Due to the lower collector efficiency (cosine, shading and blocking losses) of the LFC a larger aperture area is needed than for the PT. For optimized optical and thermal performance it seems completely feasible that due to lower investment costs per aperture area the levelised electricity costs (LEC) for the LFC are appreciably lower than for the PT. vacuum receivers. In previous studies e. g.  specific investment costs of 117 €/m2 for the LFC were compared to 220 €/m2 for PT, resulting in lower LEC for the Fresnel technology consistent with this new comparison. The question, whether for the Fresnel technology lower O&M costs which are a relevant parameter for LEC may be expected is still under discussion. The influence of optical quality on the energy and cost performance requires a careful control and optimization of the collector components. We have developed methods to characterize the key optical components as well as single components as in overall collector performance. All these methods are quite flexible and can be used — with necessary adaptations — also for other concentrating optics. The results obtained so far from different Linear Fresnel Collectors showed were positive concerning optical concentrator quality. Looking at the results and the large impact of optical quality, thermal losses, tracking and O&M on the economics of concentrating collector in solar power applications, it seems justified and necessary to build a complete solar power plant using Fresnel technology to prove expectations on electricity price. Smaller projects are under way meanwhile. The authors gratefully acknowledge the financial support for the research and development projects »FRESQUALI« and »FRESNEL2«, funded by the German Ministry of Environment, Nature Conservation and Nuclear Safety (BMU) under the numbers FKZ 16UM0079 and FKZ 16UM0050. In this paper a partial multi-criteria analysis (MCA) is used to evaluate and compare methods that can be used for detection and identification of failures or malfunctions during the operation of solar thermal systems. A multi-criteria analysis is often applied to support policy decisions and evaluate different alternatives . One of the advantages of MCA is that the criteria, on basis of which the comparison is made, are explicit. There are several MCA methods; a relatively simple one without weighting the different scores and combining these to a result score will be used here. Since the weights would depend on the application of the method, this will not be carried out here. The MCA conducted in this paper consists of four steps. The objective of the multi-criteria analysis is to evaluate several failure detection methods with regards to the effectiveness of failure detection. Key players are users of monitoring and failure detection methods and developers. They have similar aims and therefore, this will not be considered here. A further description of the methods can be found in section 3. In 2007, a solar research and development centre for the CSES in Libya was completed near Tripoli. The general contractor was Bavaria Engineering GmbH. TUV, a project partner, sub-contracted PSE AG to design, manufacture and install an indoor/outdoor test stand for solar thermal collectors. PSE worked closely with TUV and Fraunhofer ISE to design the test stand including two-axis tracker, thermostat and measured data acquisition equipment, all of which are mounted on a moveable carriage on tracks to allow for both indoor and outdoor testing. A lamp field with an artificial cold sky simulates the natural sky for indoor testing. The testing surface has space for four standard collector modules, which can be tested simultaneously in outdoor tests. The tracker has a guaranteed precision of better than ±1°. The test stand conforms to all relevant international/European standards and norms and can be used for research, testing and certification of solar thermal collectors. This project—the planning, design and installation of a solar center in Libya— began in 2002 as a contract with the federal Libyan General People’s Committee for National Academy for Scientific Research. With the installation of the last test system for solar technology, the project is now completed. The goal of the project was the installation of a research and development laboratory and scientific facilities for solar and wind energy utilization studies, including the necessary systems operation training, for the CSES of the National Office for Research and Development near Tripoli, Libya. area was designed and equipped. Bavaria Engineering GmbH (BEG), based in Munich, with its many years of experience in solar energy, led the operations as general contractor for the project from its office in Tripoli and prepared a long-term technical master plan for the project. TUV Rheinland Immissionsschutz und Energiesysteme GmbH was contracted as partner for aspects of the engineering. PSE was recommended by TUV as subcontractor for the essential components of the indoor and outdoor test stand for measurement of solar thermal collectors, and was contracted by BEG. The work group for thermal collectors at Fraunhofer ISE made itself available to PSE in an advisory capacity for the realization of the project. Already in 2003, PSE had manufactured and installed a similar indoor test stand for the GREEN Institute in Belo Horizonte, Brazil, as part of a UN project . PSE is also experienced in the construction of trackers. What is special about the stand for CSES in Libya is the combination of indoor and outdoor test stand. The concept is based on two facilities built by the company Dornier in Jordan and India in the early 1990s. 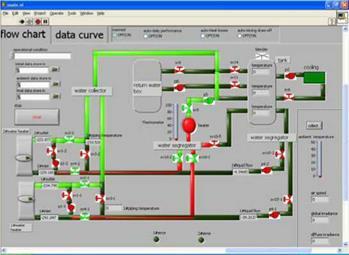 This program was developed on Labview platform. Labview operating system is the most representative system in the field of graphical programming development platform using virtual instruments. And it is also the most popular and extensive application of data acquisition and control of the development environment. The program will be intuitive and have friendly interface with operator based on Labview. Moreover, the program can be operated easily and operating procedures are shown clearly and intuitively. The whole test process can be seen in the interface and the real-time data can be shown as cures in the graph, so operator can manipulate instruments conveniently and know clearly the true situation what the instrument it is. The program can be operated in two modes, one is manual operation and the other one is automatic operation. All of information of control system can be displayed on the screen. If there is no problem to deal with by operator, the program will continuously work step by step in the automatic mode. When some errors happened, the program will enter into the situation of alarm, stop the process and record the situation. According to different test process, the program was operated in different projects, such as determination of daily system performance, determination of the degree of mixing, determination of storage tank heat loss etc. In every test process the interface is made up of three modules, namely flow charts, data curves, error alarm. As shown in Fig.4. In the window of flow chart test system can not only be directly shown in the test process, also be measured and recorded through the data acquisition system, and then be displayed on the real-time curves. These collected data can be used to identify the situation of instruments and supervise the operating situation whether it is normal or not. The program has many technical advantages as follows. It is simple to develop software to make it suit different conditions by the way of graphical data-flow programming language. And it is convenient to expand and upgrade through modular program. The interactive program interface can make program be operated flexibly. The test procedure consists of a number of one-day tests which are independent of each other. On each day of the test, the system is allowed to operate outdoors and a single draw-off is applied at the end of day. At the start of each day of the test, the system is preconditioned by flushing it with water at a known temperature. The input, (i. e. the irradiation incident on the system), and the output, (i. e. the energy contained in the hot water draw-off), are measured for each test day and plotted on an input/output diagram. The test days shall cover a range of irradiation values and values of (ta(day)- tmain) so that the dependence of the system performance on these parameters can be established. In addition to the performance characterisation in the European standard EN 12976-1 many requirements are set up regarding safety, reliability and durability of thermal solar systems. Their objective is to ensure that the systems operate reliably, even under extreme conditions such as heavy snow or wind loads or extended stagnation periods during the summer. In addition, also the documentation of the system and the installation and operation manuals have to fulfil certain requirements in order to ensure a correct installation and operation by installer and owner, respectively. The thermal performance of factory made systems is determined according to EN 12976-2 either by applying the DST-method (DST = Dynamic System Test, ISO 9459-5 /3/) or by using the CSTG — method (CSTG = Complete System Testing Group, ISO 9459-2 /2/). For both test procedures, the whole thermal solar system is installed on a test facility and operated under natural climate conditions according to well defined test sequences. The aim of both test procedures is to determine the annual system performance for specified reference conditions on the basis of short term tests. 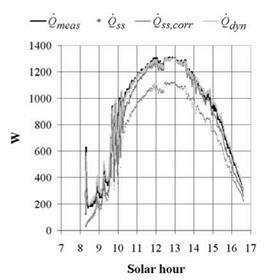 The DST-Method can be applied for thermal solar systems with and without auxiliary heating. It is therefore the most relevant test method for ‘typical’ factory made solar domestic hot water systems used in northern and middle Europe. The aim of the DST test is to determine a set of parameters which allows, in combination with a numerical model, a detailed description of the thermal behaviour of the system. These parameters are determined by means of parameter identification based on measurements which are recorded during the operation of the system on a test facility. The annual performance of the system can be predicted by using the numerical system model and the parameters determined from the system test. The DST test method is standardised in ISO/DIS 9459-5 and has been developed over many years. Its comprehensive validation was realised among others within a project supported by the EU (Bridging the Gap, Contract No. SMT4-CT96-2067 /4/). It could be shown that the DST method is able to give re-producible results for a wide range of various types of solar domestic hot water systems at different climatic conditions and locations. Today, every system configuration of a solar domestic hot water system (DHW) has to be tested by an accredited testing laboratory in order to obtain the Solar Keymark certification. Often, companies offer a product line of their solar DHW systems, which are identical with regard to their design and only differ in their collector and storage dimension. Due to the relatively cost — and time-intensive procedure of the testing it is no longer acceptable for the companies to test each system type of a product line. Hence, it is desirable to have a calculation tool that is able to predict the thermal performance of the whole product line without the need to test each of the system configurations. that the thermal performance of solar DHW systems which are part of a product line is similar, because they are based on the same design principles. Hence, the thermal performance of systems of the same product line can be described as a function of size. Figures 2a) and 2b) illustrate, for both measurement periods, measured (Qmeas) and calculated instantaneous power values, after both steady-state efficiency parameters (uncorrected — Qss — and corrected — Qss corr — calculations), form Eqs. (3) and (5), and dynamic (Qdyn ) efficiency test parameters, after Eq.(4). Regarding steady-state test parameters based calculations, integration of measured and calculated power curves in figure 2 yields, for the first measurement period, energy underestimations of 19.7% and 6.5% for uncorrected and corrected calculations, respectively. For the second measurement period, these results change to 21.3% and 10.8% underestimations, respectively. More than accuracy purposes, which can not be assessed in this case considering that test parameters were produced after these same measured results, the results presented for dynamic test parameters based calculation illustrate the dynamic response of the method. An assessment of the methodologies presented in section 2 follows directly from the comparison of instantaneous power results presented in section 5 for each of those methodologies. The results obtained for both measurement periods reveal higher deviation from measured value, for the steady-state based calculation, whenever steep variations on irradiation conditions occur, as clearly illustrated in fig.2b) for the periods between 09.00 — 10.30 and 14.00 — 15.30. This result is in line with the base assumptions of such methodology which does not account with transient conditions, as in the dynamic methodology accounting a time dependent temperature variation term. correction methodology did not claimed to correct), such power correction presents particularly good results in mid-day periods, where milder variations where observed. Test sequences of a CPC type collector were obtained allowing the application of two test methodologies, presently available for characterization of the efficiency of glazed collectors: i) steady state test methodology [EN 12975-2: section 6.1] and ii) quasi-dynamic test methodology [EN 12975­2: section 6.3], based on different model approaches for a solar collector and, consequently, imposing different algorithms for calculating the power (and energy) delivered by solar thermal collectors. The different algorithms were presented, including the application of an algorithm for correction of power/energy results to steady state results as proposed by Horta et al. (2008). Application of these algorithms to two days of measured data allowed for a comparison of the results obtained with these different methodologies. • considering the use of steady-state parameters, by far the most commonly available for marketed collectors, the use of the power correction methodology proposed by Horta et al. (2008) leads to more accurate results, revealing better results throughout the entire set of measurements and particularly good results under irradiation conditions closer to stationarity (milder variations, as in mid-day periods). Furthermore, and regarding the algorithm for correction of power/energy results to steady state results proposed by Horta et al. (2008), these results validate its application against measured results of independent test of a general product. The results obtained recommend its adoption in the different software tools making use of steady-state efficiency test results. EN 12975-2:2006. Thermal solar systems and components — Solar collectors — Part 2: Test Methods, Section 6.1 and Section 6.3. European Standard, March 2006. Horta, P., Carvalho, M. J., Collares-Pereira, M., Carbajal, W., “Long term performance calculations based on steady state efficiency test results: analysis of optical effects affecting beam, diffuse and reflected radiation”, Solar Energy, 2008, doi:10.1016/j. solener.2008.01.004. In Press. Mclntire, W. R., “Factored approximations for biaxial incident angle modifiers”, Solar Energy 29 (4), 315­322, 1982. Rabl, A., “Active Solar Collectors and their applications”, Oxford University Press, Oxford, 1985. In most cases in which solar thermal systems were monitored, the failure detection consisted of analysis of measurement data by an expert. An expert with enough experience can recognize if a system is performing as expected based on analysis of data. A state-of-the art example is provided in the Austrian demonstration project Optisol (OPT), in which 10 large solar thermal systems were built and monitored for ca. 1 year . The characterization of collector efficiency is the fundamental tool for long term thermal performance calculation, i. e. collector yield, and for design of solar thermal systems. It is, thus, one of the most important inputs in software tools aiming at the design of solar thermal systems. Solar air collectors systems may have a number of advantages compared to solar collectors using a liquid heat transfer fluid. Just to mention some of them: solar air collectors are safe with respect to stagnation, because air as the heat transfer medium is not affected or destroyed by high temperatures. Air also does not boil or evaporate and no vapour pressure is built up in the solar loop under stagnation conditions. There is no need for membrane expansion vessels in the solar loop. Air as heat transfer fluid does not cost anything and does not need to be exchanged. But also disadvantages exist, such as the necessity of larger heat exchanging areas, more voluminous air ducts compared to water pipes and (depending on system applications) a possibly higher auxiliary energy demand for the transport of energy by air. With respect to system aspects, it may be mentioned that solar heated air can directly be used to heat residential — and office-buildings or industrial factory halls. The solar heat can also be stored, using suitable air-to-water heat exchangers together with water storage tanks or directly in other storages such as pebble bed storages. The specific heat capacity of air does not only depend on temperature, but also on the humidity of the air, see figure 3. The steep decreases at low temperatures denote the range in which the air is saturated and the water vapour condenses. In the range of the normal operating conditions, the value of cp increases at a given temperature by 1.6% when the absolute humidity is decreased from 1g/m3 to 20 g/m3. Figure 2 shows the overall procedure used in this work, and each block is described hereafter. But before the description of the method, it is necessary to show that neural networks are able to accurately model the components of the solar system. In fact three parts of the system are monitored: the collector array, the connecting pipe from the tank to the collectors, and the return connecting pipe. As two components are similar, only two networks will be presented here.